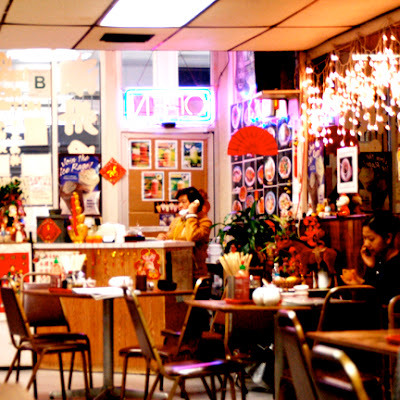 Over the years, Chinatown has become less of a Chinese-populated areas. The Chinese have most east towards the San Gabriel Valley, the land of good food. The majority of incoming businesses are now run by Vietnamese, Cambodians and people from the Chiu Chow province, you can bet there's going to be some good food. You have your toy shops, jewelry stores and mom/pop shops. And of course, there's good food. On the corner of Alpine and New High street is the Alpine Plaza, a small indoor mall again, occupied by toy shops, jewelry stores and mom/pop shops. Upon walking in you'll see some old 22" inch tv's either displaying keno numbers or the news. Video games that have probably not been updated since the late 90's still beckon you to give them your shiny quarter. A dirty, worn-down pony also hopes that you will put your child on its saddle. 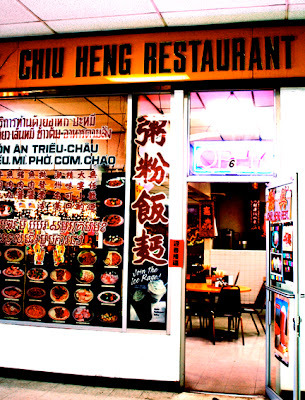 And then there's Chiu Heng, a Chiu Chow restaurant that I've been going to since the early 90s. My dad, the true Noodle Whore, loves Chiu Chow style food. 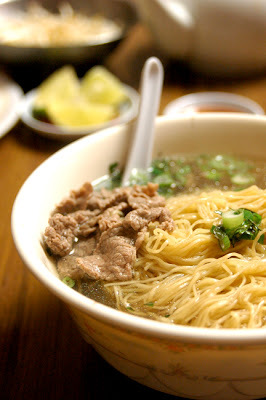 Back in my Hong Kong posting, I talked a lot about the various Chiu Chow noodles you could find. 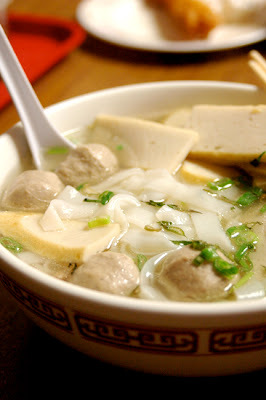 Long story short, they are located near Canton and Vietnam and have great seafood and noodle dishes. It's not hard to recognize Chiu Heng with it's menu stickered up on the window - a standard technique used by many Asian establishments to lure you in. And the busyness doesn't stop there. Once you walk in, it looks like a garage sale: old furniture, random decor and christmas lights. This is my kind of place. Chiu Heng wears a "B" badge, but that is not inclusive of its ambiance. Are you getting a headache? The lady at the register is the owner and she's a sweet lady. She always knows what I'm getting. Don't be intimidated by the menu. There are 3-4 different languages going on: English, Chinese, Vietnamese and Cambodian. All Chiu Chow restaurants design their menu this way because of their multi-ethnic patrons. The Chiu Chow province, historically, must've been a place for trade or stopover for people visiting from neighboring countries. You have to be careful here. Chiu Heng will always try to upsell you. 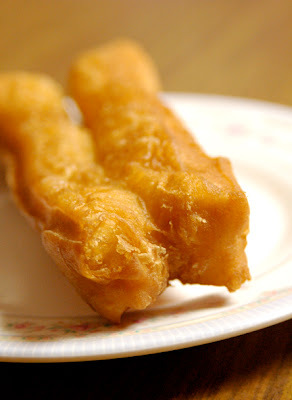 Right when you sit down, a man with balding hair will walk up to your table and give you some Chinese fried donuts. These are not FREE. They are $2-3 for 4 pieces, so beware. If you've never had these, try them. Asian people love to dip these in porridge and in broth. Overall, Chiu Heng isn't the greatest Chiu Heng restaurant. But it does serve you well when you're up at 7 am with a horrible hangover. There's another Chiu Chow restaurant on Broadway next to the Pho 79, and it's much better. But for me, it's the closest thing I can get to good Chiu Chow when I'm in the Chinatown/Silverlake area. The SGV has more Chiu Chow restaurants that are better than Chiu Heng as well. Sometimes, you just don't wanna drive so far.